On October 28, 2014, Annie Lepkowski’s husband, Frank, died unexpectedly of an undiagnosed enlarged heart. He was 59 years old. At 54, Annie became Solo Mom to kids Avery, Keelin, and Cameron for a second time: Lepkowski had divorced the kids’ dad years before, and her 2011 marriage to Frank had been a joyous new beginning. The death blindsided Lepkowski, but more than a year after losing the man she has described as her best friend and soul mate, she is redefining her path. To what does she ascribe her resilience? During a long-ranging conversation, Lepkowski discussed the factors that have helped her begin to heal in the wake of tragedy. As the months passed, the scope of the event broadened. “It became about people and community, but also music and art,” Lepkowski says. She and Frank had shared a deep, abiding love of music, and as she planned, music assumed an increasingly greater role. A Facebook friend, Eric Patrick Kelly, helped her design an invitation patterned after concert posters. Her son Cameron’s band agreed to play at the event; she hired another friend to act as deejay. Some elements of the evening came together seemingly magically: when Lepkowski decided to incorporate a silent auction to raise funds for the American Heart Association (AHA) in honor of Frank, people came forward, offering everything from hand-knit scarves to artwork and gift cards as auction items. The party took place on February 27, 2016, and as hopeful as Lepkowski had felt in the planning, the event exceeded even her expectations. Housed in an enclosed farmers’ market space in downtown Royal Oak, the party drew more than 300 people. Lepkowski had operated on a tight budget: she and the kids did the decorations themselves, hanging posters, covering long tables with red butcher paper, and lighting candles set out on “wood cookies,” or slices of wood, that a friend had cut from a fallen tree. Friends donated chili, corn bread, wine, and desserts, along with more than 20 items for the silent auction. Local breweries contributed kegs of craft beer; neighborhood businesses donated food items and paper goods. Creativity informed every aspect of the event’s fundraising. Lepkowski cut a large, simple heart out of burlap; for a donation, guests could choose a colorful button and sew it to the fabric. Also for a donation, they might set a bright candle afloat in tubs of water marked with legends such as “Gratitude” or “Hope.” These activities, along with proceeds from the silent auction, raised upwards of $3,000 for the AHA. Growth, of course, means change, and Lepkowski says embracing that change is part of the journey. “My life is very different than it was two years ago,” she says. “Sometimes I feel guilt about that. But I’ve come to see change as part of life; there are things you can control, and things you can’t. What you can control is how you approach change and adversity.” She tells the story of a grandfather and his grandson. The grandfather describes two wolves: one represents fear and anxiety, the other is love and compassion. “Which wolf is stronger?” Lepkowski asks. “Well, it depends on which one I feed. At times I have let fear get a hold of me this past year, but I’ve pushed through.” Change, she adds, invites you to take care of yourself—or not. “You can go down one path or another,” she says. 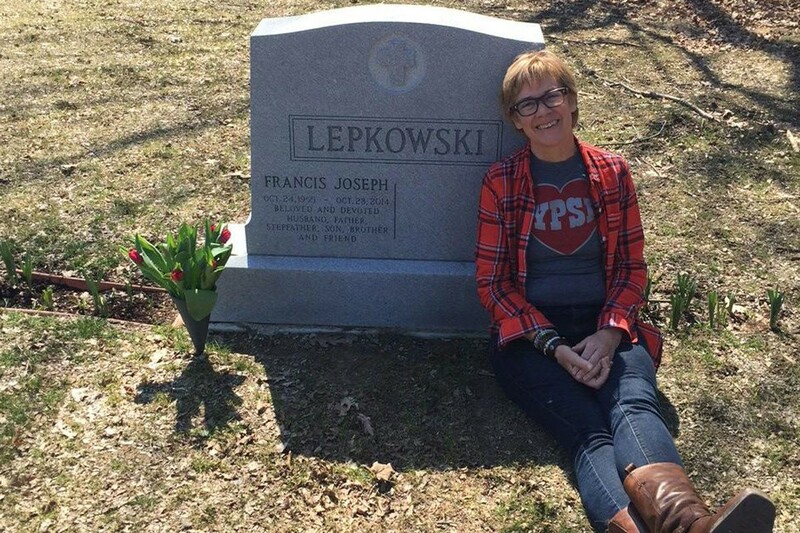 Lepkowski chose to take care of herself, and when I ask her what prompted her to do so, her response is immediate: “I was devastated when Frank died. Just devastated,” she says. “Around February , I remember standing at the kitchen sink. Cameron came up to me and said, ‘We need our mom.’” Lepkowski realized that to be there for her kids, she had to take better care of herself: “Things had become very real very quickly about what’s important and what’s not,” she says. Lepkowski had always tried to make healthy eating choices, but in 2015, she redoubled her efforts; she ramped up her practice of yoga, biking, and hiking. By Lepkowski’s account, she was overweight at the time of Frank’s death; by the time she hosted the party that honored him, she’d lost 70 pounds and reached a healthy goal weight. During this journey, whenever she felt her resolve sagging, she’d think of the way Frank used to say to her, “Baby, you just keep on being your wonderful you.” Slowly, over the year, it became her own encouraging voice she heard.